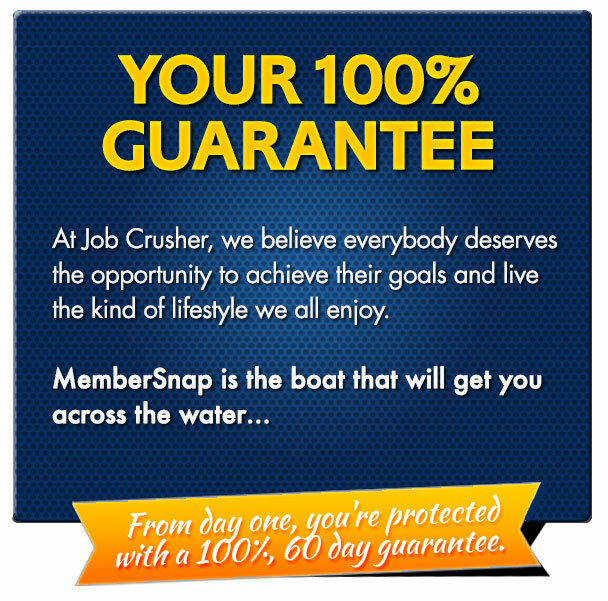 With your MemberSnap account, you’ll be dominating 3 killer niches within days and weeks, with push button simplicty. But for some of you, 3 websites ‘aint enough. … and we don’t blame you. After all, the more websites you have, the more money you make, right? We’d like to reward you for taking action already, so we’re going to make you a special offer that is friendly on your wallet and totally removes the risk for you. Yes! Are you crazy? Of course I want to get this awesome product. I will be charged $1 for this today and I can access it for the first 7 days. I also understand that this is a subscription that renews automatically after the first 7 days for $37 per month and that I can cancel at any time. It’s our way of saying thankyou, and showing you that we’re committed to your success. If you’re not totally blown away by the content and value you get within your first 7 days, then simply cancel and walk away, no hard feelings. Maybe you’d pay off the mortgage early? Maybe you’d just quit your day job and travel the globe? Maybe you’d even be able to save someone’s life, or change it for the better? Whatever you need the money for, these numbers are very possible when you have 20 killer MemberSnap websites up and running from day one. Yes, even if you deliberately screw up! 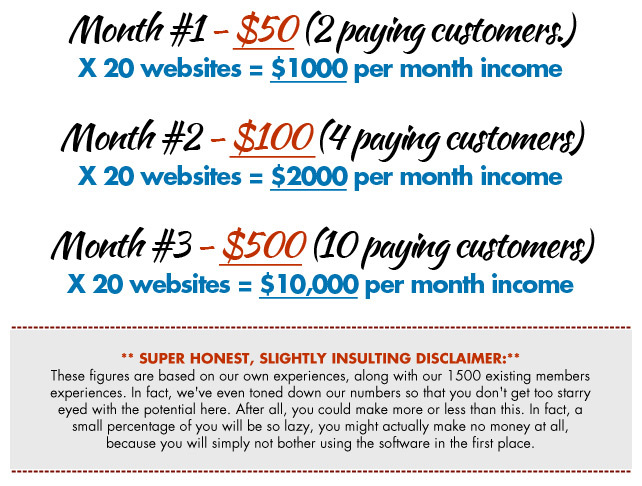 As you can see, even if your individual websites only ever pulled in a measly 2 members, paying $25 each, that could easily add up to $1000 per month across 20 websites. And that’s before you’ve even really tried. So how much is that kind of income worth to you? … you could be paying thousands, with no guaranteed results to show for it. Upgrade today, and try this out. 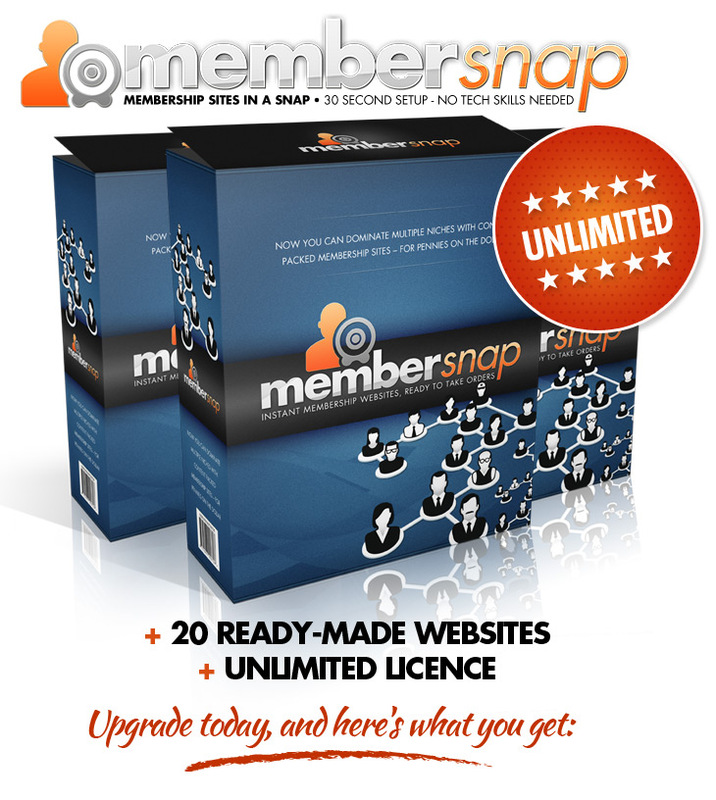 … and see how much faster you’ll get to that predictable regular membership income as a result. And again, see how fast and easy it really is to create membership websites in a snap, without any skills or experience. And if you’re not totally convinced, we’ll refund your tiny investment here today, in full, with no questions asked. It’s fast, easy and extremely profitable. 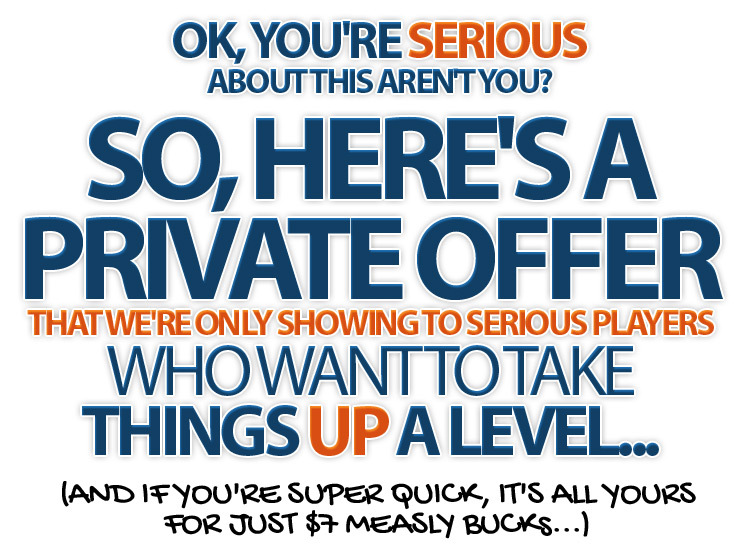 How can we be so sure that Membersnap will be easy, fast and profitable for you, just like it has for 1500 other people? 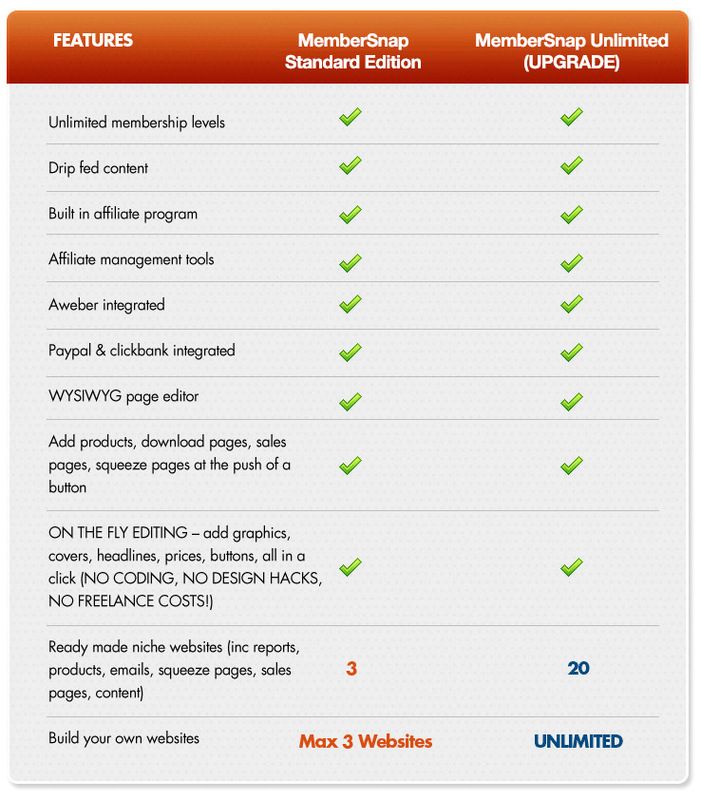 … especially this upgraded version with 20 ready-made websites at your fingertips. So BUY NOW, before we shut this down. We’re rewarding action takers with the lowest possible price… because we only want go-getters in our private Membersnap club. So ACT NOW, and join us before the price goes up again, or worse, before this is pulled completely off sale. Continue spending money on membership scripts, design tools, plugins… continue wearing your fingers to the bone writing content… continue selling one-off products with no monthly income security… continue slaving over building websites and products from scratch, dealing with technical hassles, and making peanuts in return. Just point and click to your first professional website, complete with a proven marketing funnel and HOT products to sell as your own, within 120 seconds. No need for hundreds of dollars worth of software, no need to hire programmers and designers, no need to work like a dog to get off the ground. … so you can jump straight to the front of the line, and start generating an income with your ready-made, MONTHLY income machines. 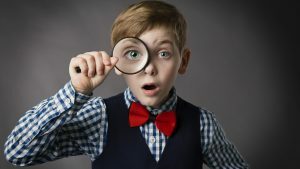 Remember, creating a substantial online business usually takes months of technical hassles, thousands of dollars, tons of time to research and create products, plus a major steep learning curve that drains most people’s energy before they’ve even made their first buck. And we’re here to stay… we’ve been in business for over a decade, and with 1500 existing customers, we know how to make sure you become the next internet success story too. And if you’re not immediately convinced, then you’re protected by our NO BS, 100% 60 day guarantee, just for good measure. Just point and click, and you’re done… with monthly cash machines that are already loaded with products, content, emails and complete designs. But this won’t be around forever, so grab your spot now, before it’s gone for good.